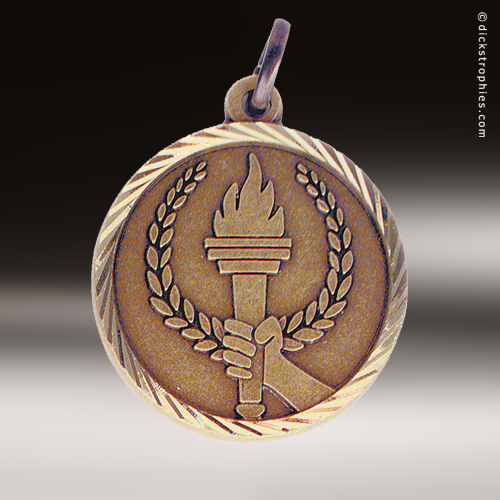 The budget friendly price point on these torch medals makes them perfect for those larger events or tournaments where several awards are needed. 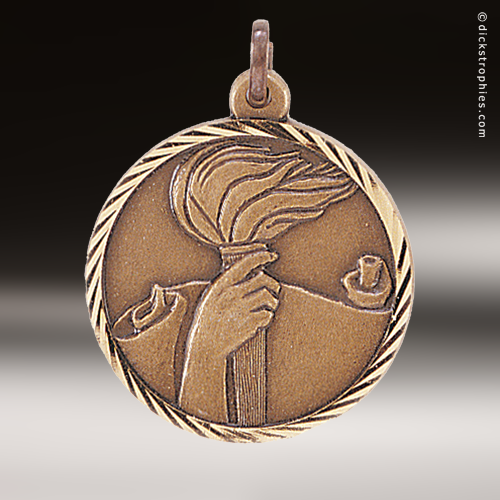 The medal features a flaming torch circled by a border of stars and stripes. The ring at the top allows for a ribbon to be easily attached, and the back can be personalized for your event, or to honor the achievement of an individual. This medal is available in Gold, Silver, and Bronze. This Most Improved Super Star medal has a decorative star that frames the center of the medal. A star sits above a ribbon with the words Most Improved completes the award that is available in gold. In addition to many other activities or sports these medal come in your choice of gold, silver or bronze finish. The back of the medal has more than enough room for all of your personalization needs. All you need to do is pick a ribbon and you are all set to go! These Victory Super Star medals have a decorative star that frames the center of the medal. An iconic victory torch fills the front of this 2 1/4" in diameter medal. In addition to many other sports or activities these medal come in your choice of gold, silver or bronze finish. The back of the medal has more than enough room for all of your personalization needs. All you need to do is pick a ribbon and you are all set to go!